Renewable energies and connected, compact cities are the key to unlocking sustainable economic growth for India’s urban future. Photo by Binu K S/Flickr. Taking even a quick look at India’s current pattern of growth, it’s not hard to see both the rising energy insecurity and the stress that cities across the country are experiencing. Congestion, urban sprawl, and poor access to reliable energy are daunting challenges to the development of the country. However, by developing connected, compact cities and encouraging more renewable energy use, India can pave the way for sustainable economic growth, universal access to energy, and enhanced quality of life for its citizens. 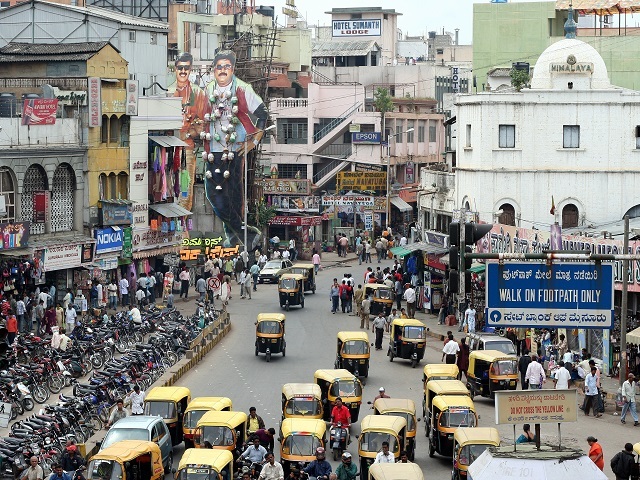 India’s cities are bursting with growth. The country’s urban population will exceed 600 million in the next 15 years, and cities will account for 75 percent of national GDP. However, even economic output is likely to be impacted by congestion, urban sprawl and high levels of pollution. Delhi, Patna, Gwalior and Raipur already have some of the worst air pollution levels in the world. In fact, the World Bank estimates that the impact of growth-only oriented policies are costing the Indian economy a staggering 5.7 percent of the GDP as a result of urban air pollution, and 3.5 percent of the GDP as a result of ecosystem service losses. India’s quickly rising demand for energy is consistent with the country’s recent urban growth. Large swaths of the country—especially the rural poor—have little or no access to a reliable source of power. With limited natural resources for domestic production, energy will continue to be a serious constraint to growth and development unless policy changes, new business models, and innovative finance solutions are adopted to harness energy-efficient technologies, tap renewable resources, and advance universal access to energy. Evidence shows that designing connected and compact rather than sprawling cities can save trillions of dollars globally. Recent thinking about urban planning highlights the need for: a) efficient public transport systems that can reliably move city residents to their destinations, b) high-quality, walkable public spaces, and c) environmentally sustainable infrastructure such as reliable water supply and sewer systems. Cities use the most energy, and produce the most greenhouse gas emissions. By focusing on building and appliance efficiency and integrating energy planning models from both the demand (energy efficiency) and supply (renewables, distributed generation) sides, India will make progress toward ensuring reliable and sustainable energy access for all. The Indian government has made ambitious public commitments to both sustainable energy and urban development. It has already announced plans to build 100 smart cities across the country by 2024 in a collaborative public-private partnership. On energy, the government has revised its solar targets for 2022 to 100 gigawatts—more than five times the previous goal—and is considering a new target of 60 gigawatts in wind energy capacity. In fact, discussing clean energy was a big part of Indian Prime Minister Narendra Modi’s agenda during President Obama’s visit to New Delhi last month. Integrate public transport infrastructure and land development to ensure efficient expansion of urban areas and accommodate growing populations. In the long-term, the Indian government and its partners—whether public or private—will need a more holistic path towards development. Growth in cities is unstoppable; but why is there such massive growth in Indian in the cities in the first place? The discourse on sustainable development must address the causes of urbanization. Eventually, India’s path to sustainable economic growth will have to take into account the economic geography of land, food, water and energy, as well as the development of peri-urban and rural areas of the country.